In 1932, John Ruan's first delivery was a hand-shoveled load of gravel. Since then, we've become an expert in transporting a variety of bulk products, and today we are the leading supplier of bulk transportation services to private fleet and contract carriage shippers nationwide. We've been transporting food-grade products since the early 1950s. Our drivers are assigned to individual shippers, so they handle the same type of equipment and cargo on every run. That experience—with your job site, your personnel and your product—is invaluable in increasing efficiency and achieving on-time deliveries. 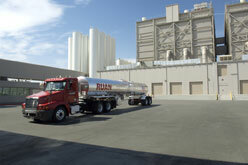 In terms of dairy and bulk food grade, no company has more experience and capacity than Ruan. We haul tens of millions of pounds of bulk dairy from farm to plant every single day. Maximizing our productivity calls for superb fleet management, and one of the ways we do it is through the use of innovative technology. Our proprietary RedTrak system gives Ruan drivers the ability to receive real-time dispatch information and wirelessly submit all data associated with each load. RedTrak uses web-enabled mobile devices linked to our online dispatch application. Using the mobile units, Ruan's drivers, who are trained and certified to handle bulk milk, can quickly scan and transmit load information, automatically creating a detailed record of each milk shipment. The driver-assigned RedTrak hand-held units also have a built-in GPS system that enables dispatchers to track vehicle movement and activity. All this information allows us to get more milk to the plant most able to process it—keeping milk fresh, saving time and increasing productivity. We have extensive experience hauling bulk earth construction materials. John Ruan's first load, after all, was delivered to a construction site. Our customers appreciate Ruan's flexibility. Some days construction customers need one load, and other days they need 20. Ruan utilizes technology and daily customer contact to make certain our clients' needs are being met. We work with our customers to design tractor and trailer solutions that provide higher payloads, while reducing cost per hundredweight by as much as 20 percent. This attention to detail, combined with more than 80 years of construction site experience, helps keep our customers building.